These Feathers From Heaven Sterling Silver Bali Earrings are made in Indonesia. These hand crafted earrings have a crystal top jewel connected to another crystal jewel by a sterling silver feather detail. 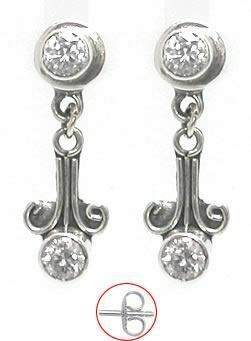 These earrings will add an element of elegance to any outfit. Check out this matching Feathers From Heaven Belly Button Ring and ruffle some feathers with your Feather body jewelry ensemble.